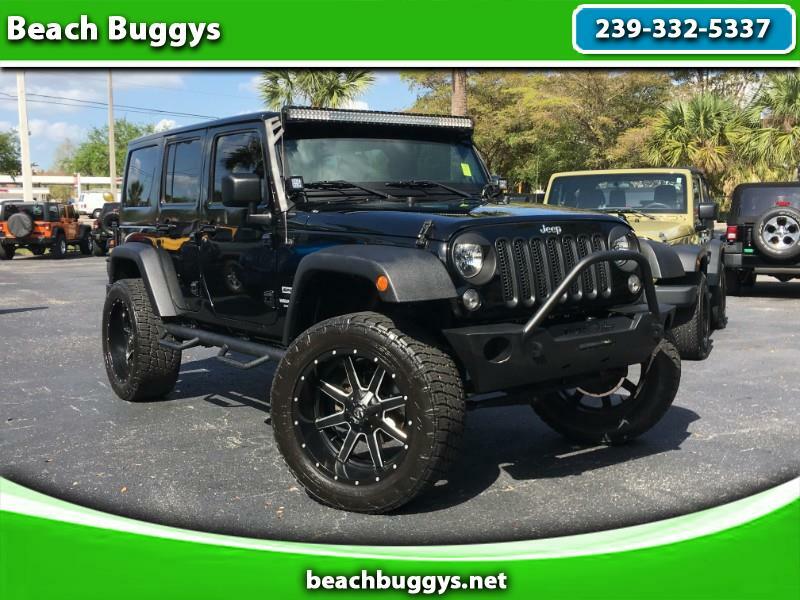 This 2014 Jeep Wrangler Unlimited Sport comes equipped with Power Windows & Locks, Hard Top or Swap to Soft Top, Full Suspension Lift Package, Fuel Wheels, 35" Nitto Terra Grappler AT Tires, LED Lights, Prime Steel Front Bumper w/ Winch Plate, Electronic Stability Control, Hill Start Assist, Trailer Sway Damping, 4-Wheel Disc Brakes, Low Back Bucket Seats, Advanced Multistage Front Air Bags, Command-Trac Shift-on-the-Fly 4WD, Next Gen. Dana 30 Solid Front Axle, Next Gen. Dana 44 HD Rear Axle, Conventional Differential Frt Axle, Conventional Differential Rear Axle, Conventional Differential Rear Axle, Sentry Key Theft Deterrent System, 22.5 Gallon Fuel Tank, Black Clear Coat, Steering Wheel Mounted Audio Ctrls, Front Stabilizer Bar, Rear Stabilizer Bar, Full Size Spare Tire, Fuel Tank Skid Plate Shield, Transfer Case Skid Plate Shield, Max Tow Package, Max Tow Package, Traction Control, Electronic Roll Mitigation, Hydraulic Assist Brake Booster, 5-Speed Auto W5A580 Transmission, 3.73 Rear Axle Ratio, 3.6L V6 24V VVT Engine, Power Heated Mirrors, Remote Keyless Entry, Security Alarm, SIRIUS Satellite Radio, Leather Wrapped Steering Wheel, Tip Start, Class II Receiver Hitch. This is a One Owner Clean CarFax Florida Jeep! Contact our experienced sales staff members today for more info.